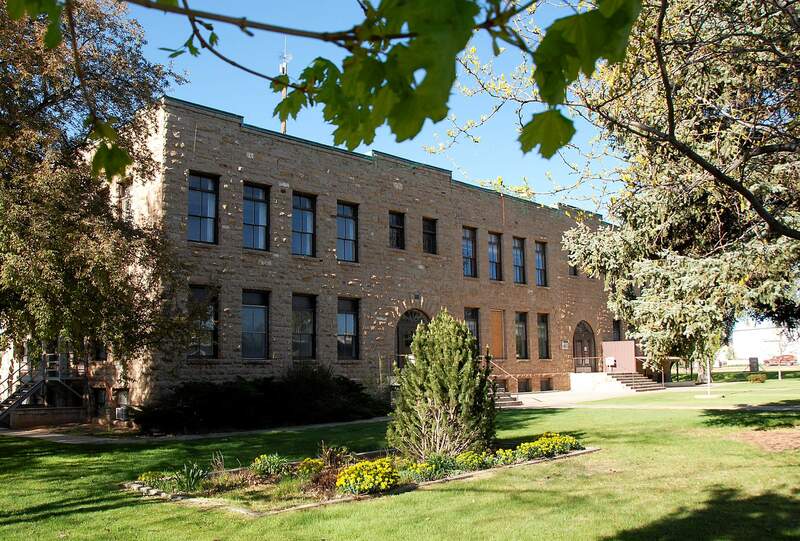 Alex Carter, superintendent for the Montezuma-Cortez Re-1 School District, said the developers who purchased the Calkins Building are planning to renovate the former schoolhouse into an 18-unit residential complex. Montezuma-Cortez Re-1 board members got a glimpse of a proposal to transform the historic Calkins Building into a residential facility. Superintendent Alex Carter unveiled an artist’s rendering of the design plans at a recent meeting, stating that developers hoped to renovate the former schoolhouse into an 18-unit residential complex. He said developers also planned to construct three separate townhome structures and an additional 30-unit residential facility on the existing property. According to Carter, developers said some of the proposed residential units would be earmarked for affordable housing, one of the district’s greatest concerns when recruiting new teachers, he said. “It looks like (the Calkins Building project) is continuing to move along,” Carter told board members on Jan. 19. One year ago, the district approved the sale of the boarded-up, three-story Calkins Building and surrounding 6-plus-acre property to a Kansas City investment group for $275,000. The deadline to finalize the sale is Nov. 23, according to an amended purchase agreement. Barber explained that redevelopment of the Calkins Building and construction of a residential structure to the west was the first phase of the total project. The second phase of development would add about 15 townhouses on the corner of Second and Ash streets, south of the Calkins Building. South of Second Street, where the existing soccer field is, would be reserved for additional residential homes in the future. “This will be a quality development, with a parklike setting around the Calkins Building,” Barber added. Exempt from taxes, the downtown building has never been appraised, according to the Montezuma County Assessor’s Office. The 6.65 acres of land surrounding the building is valued at $154,280. Barber and her partner, Ivy Tu, are working to include the 107-year-old structure on the National Register of Historic Places. Kansas City-based Rosin Preservation, a historic consultant for the project, is charged with submitting the application. “We are proud to say, the Calkins Building has been approved for nomination and the honor as a National Historic Building,” Barber said. More than 90,000 properties are listed on the National Register, which is the first step toward eligibility for National Park Service-administered federal preservation tax credits. Across Colorado, nearly 1,500 sites are listed on the National Register, including 34 in Montezuma County. Constructed for $14,000 by Swedish immigrant Peter Baxstrom in 1909, the Calkins Building in downtown Cortez includes two additions, made in 1924 and 1937, respectively. The building served as a community schoolhouse through the mid-1960s. The building underwent some renovation about a decade ago with hopes to remodel the structure for district administrative office space, but the project was shelved in 2008 due to a lack of funding. It was estimated at the time that renovation efforts could cost as much as $5 million.